Registered in Guinness Book of World Records-Astrolabium Galileo Galilei. 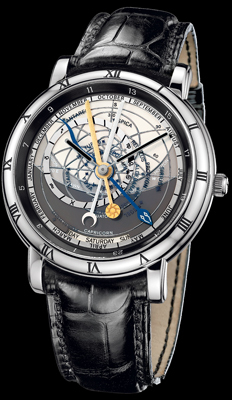 This EXCEPTIONAL MASTERPIECE was created by Master Watchmaker Lugwig Ocheslin. It is crafted from platium,and indicates position of the sun,the moon and stars in the sky at any given hour as seen from Earth,indicates sunrise,sunset, dawn and dusk,moonphases,moonrise and moonset,lunar & solar eclipses,month and day of week. Available on a crocodile leather strap.